Hello everybody. I’m leaving WordPress to switch to a custom domain http://nibsirahsieu.com, and the blog itself has been built using sfSimpleBlog15Plugin, a plugin for symfony 1.4. One of the features offered by sfPropel15Plugin is sortable behavior. This behavior allows a model to become an ordered list, and provides numerous methods to traverse this list in an efficient way (as said in the doc ;)). 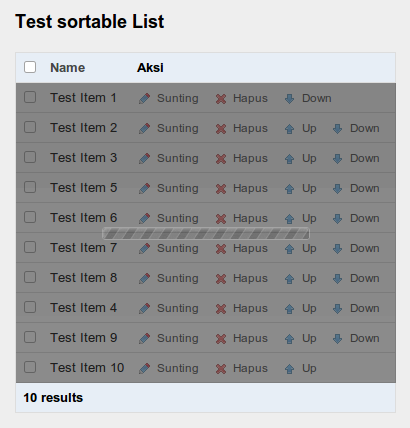 In this article, i would like to share how to implement the sortable behavior, and add the AJAX support to allow direct drag-and-drop ordering.